Baer, Chrysostom, trans. and ed. Thomas Aquinas: Commentaries on St. Paul’s Epistles to Timothy, Titus, and Philemon. South Bend: St. Augustine’s, 2007. _____. Thomas Aquinas: Commentary on the Epistle to the Hebrews. South Bend: St. Augustine’s, 2006. Boylan, Patrick. 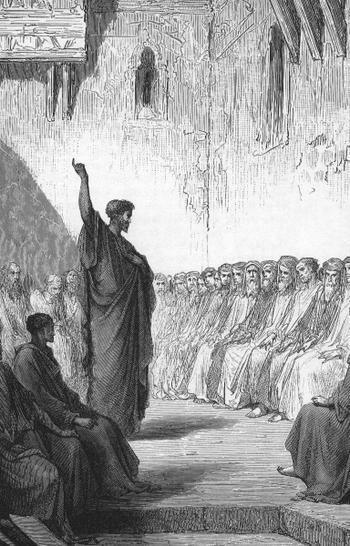 St. Paul’s Epistle to the Romans: Translation and Commentary. Dublin: M. H. Gill, 1947. Fuentes, Antonio. “New Testament Guide: 1 and 2 Corinthians” in This Rock, Vol. 4, No. 4, April 1993. _____. “New Testament Guide: Ephesians” in This Rock, Vol. 4, No. 12, December 1993. _____. “New Testament Guide: Galatians” in This Rock, Vol. 4, No. 6, June 1993. _____. “New Testament Guide: Philippians, Colossians, Philemon” in This Rock, Vol. 6, No. 1, January 1995. _____. “New Testament Guide: Hebrews” in This Rock, Vol. 3, No. 11, November 1992. _____. “New Testament Guide: Romans” in This Rock, Vol. 3, No. 9, September 1992. _____. “New Testament Guide: 1 and 2 Thessalonians” in This Rock, Vol. 5, No. 7/8, July/August 1994. _____. “New Testament Guide: Timothy and Titus” in This Rock, Vol. 6, No. 3, March 1995. Lagrange, M. J. Luther on the Eve of His Revolt: A Criticism of Luther’s Lectures on the Epistle to the Romans given at Wittenberg in 1515-1516. NY: Cathedral Library, 1918. Lamb, Matthew L., trans. Aquinas Scripture Series, Volume 2: Commentary on Saint Paul’s Epistle to the Ephesians, by St. Thomas Aquinas. NY: Magi, 1966. Larcher, F. R., trans. Aquinas Scripture Series, Volume 1: Commentary on Saint Paul’s Epistle to the Galatians, by St. Thomas Aquinas. NY: Magi, 1966. _____. St. Thomas Aquinas: Commentary on Colossians. Naples: Sapientia, 2006. Larcher, F. R. and Michael Duffy, trans. Aquinas Scripture Series, Volume 3: Commentary on Saint Paul’s First Letter to the Thessalonians and Letter to the Philippians. NY: Magi, 1969. Lattey, C. Readings in First Corinthians: Church Beginnings in Greece. St. Louis: Herder, 1928. Plumer, Eric, trans. Oxford Early Christian Studies: Augustine’s Commentary on Galatians. Oxford: Oxford University, 2006. Scheck, Thomas P., trans. St. Jerome’s Commentaries on Galatians, Titus, and Philemon. Notre Dame: University of Notre Dame, 2010. Vanhoye, Albert. Our Priest is Christ: The Doctrine of the Epistle to the Hebrews. Roma: P.I.B., 1977. _____. Subsidia Biblica 12: Structure and Message of the Epistle to the Hebrews. Roma: Editrice Pontificio Istituto Biblico, 1989.